I have to admit that I was one of the frenzied Tweeters this past weekend that helped set a sports event record for generating more than 9,240 tweets per second when Denver Broncos (and former UF Gator) quarterback Tim Tebow completed an 80-yard touchdown pass on the first play of the overtime NFL playoff game against the Pittsburgh Steelers. As a fervent Gator fan and UF alumni, it was great to see Tebow strike again in an electrifying fashion. And like many passionate social media users, sharing the moment with those immediately surrounding me wasn't enough. I needed to share my experience of the special moment with a much broader audience. Social media platforms like Facebook and Twitter have provided a social megaphone for people, who aren't satisfied they've bragged enough, laughed out aloud enough or empathized and consoled enough until they've shared their experiences and latest life events on social media. It's part of our new digital sociological mindset. How often do you hear somebody today blurt out "Facebook" right after snapping an interesting candid or posed picture at a family and friend gathering. 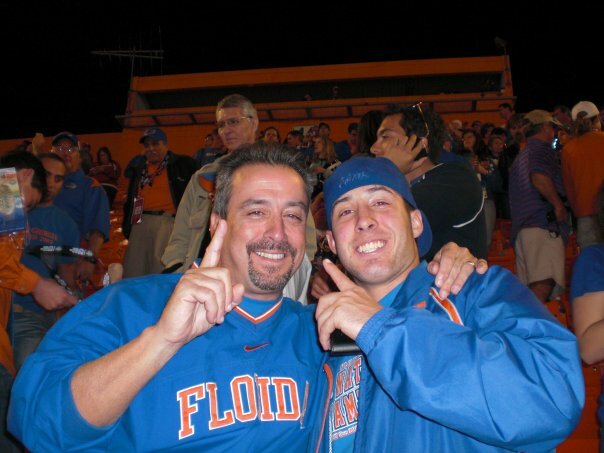 A couple of years ago, my son and I enjoyed watching Tebow lead the Gators' to a national championship and snapped this photo to commemorate the event. You guessed it. I uploaded the photo to Facebook amidst the celebration in the stands.